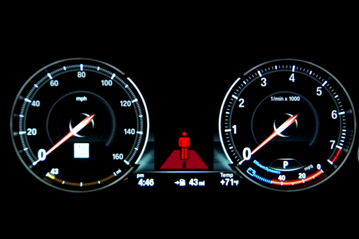 BMW’s Pedestrian Warning with City Brake Activation is a system intended to warn the driver and prompt him or her to intervene if there is imminent danger of a collision with a pedestrian. The system is controlled via the camera in the base of the rear-view mirror. It issues a warning from speeds of 10 km/h up to 60 km/h when a collision with pedestrian is imminent and simultaneously preconditions the brakes for a faster response in case the driver applies them. As a final measure, the car will autonomously apply the brakes shortly before the collision in case the driver does not respond to the warning given. BMW’s Pedestrian Warning with City Brake Activation system is a technology designed to help avoid or mitigate pedestrian accidents at lower speeds. To quantify the safety benefit, BMW identified that 20-30% of all serious accidents within city environment involve vulnerable road users. Taking into account the system specifications of the Pedestrian Warning with City Brake Activation system, around 10% of these accidents could potentially be avoided with the autonomous brake function alone. The expected benefit increases when the driver reacts to the warning in due time. BMW has tested the system extensively during its development on test tracks and real life situations. A large number of simulations have been carried out to identify the benefit of the system using different driver/pedestrian models. In addition, an independent Euro NCAP laboratory tested the system and verified that it performed as claimed by BMW.